The original crypto trading bot. Gunbot v12 is out now! Bitmex support with ROE trailing! Optimized strategies for margin trading on Bitmex & much more! as often as you want, for free! Get your life time license with free updates & awesome support. Gunbot is an advanced but easy to use crypto trading bot. It allows you to generate profits by automatically "buying low, selling high". The browser based interface allows you to easily manage your trading strategies and monitor the results. What sets Gunbot apart from other bots are the innovative strategies, speed, extreme flexibility and awesome user community. No need to trust a cloud service: Gunbot fully runs on your own system (Windows, macOS, Linux or Raspberry Pi). New to trading? Tried and tested trading strategy presets make it easy to get started. Unlimited bot instances, headless mode, powerful JSON based configuration. Gunbot allows you to go crazy. Choose from 15 preset trading strategies with tested default settings. Using over 150 different parameters, you can customize every strategy to your trading style. Use industry standard indicators to restrict trades to very specific market conditions. 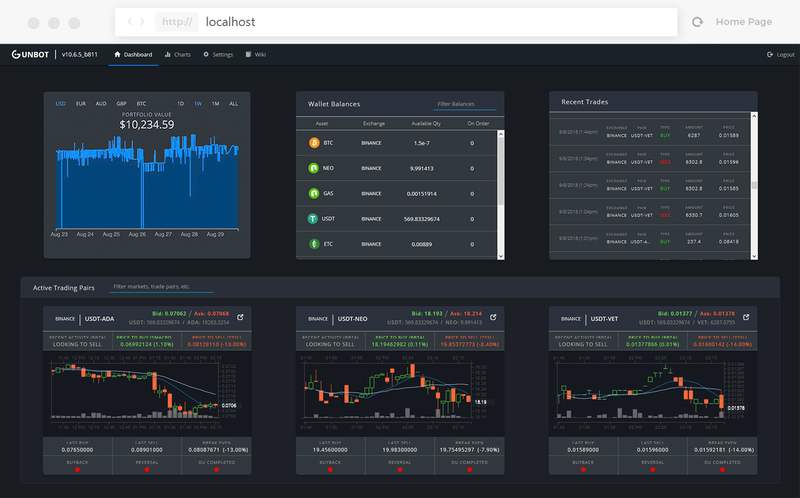 Choose between ADX, RSI, Stochastic, StochRSI, MFI, EMA, EMAspread & more! Use configurable price trailing options to get even better trades. This way trades are only placed when prices stopped moving in a certain direction. There are no limits to the amount of trading pairs Gunbot can actively trade. You decide if you want to trade just one or one hundred markets simultaneously. DCA allows you to automatically average down assets you already own. You can configure the conditions, frequency and maximum spendings. Reversal trading is a Gunbot technique to automatically accumulate more of an asset while prices keep dropping, without investing additional funds. Gunbot is sold as a lifetime software license with free updates. Licence ownership is validated through the blockchain, using a utility token called GUNTHY on the Ethereum blockchain. You can even sell your license if you don't need it anymore. Upgrades are available for existing Gunbot users only. Get in touch to make it happen!